Andrew believes that climate change is a real and urgent threat. Politicians like Donald Trump, who call it a “hoax,” and Governor Rick Scott, who banned the words “climate change” and “global warming,” are putting us and future generations of Floridians at risk. These politicians have failed to take action against climate change, with Florida having the most property at risk in the nation. Not only does their lack of action threaten the future of the planet, it also ignores an enormous economic opportunity to make the U.S. the world’s leader in clean energy and to put people to work at every rung of the income ladder. Over the last two decades, Tallahassee has reduced its carbon emission intensity by 40%, and under his leadership, has reduced the carbon footprint of electricity users in the city by 20%. The Mayor has worked both as Mayor and City Commissioner to implement and improve programs like free residential and commercial audits, low-interest energy loans, and community outreach programs, as well breaking ground on the new 120-acre solar farm that will triple the City’s solar energy capacity. 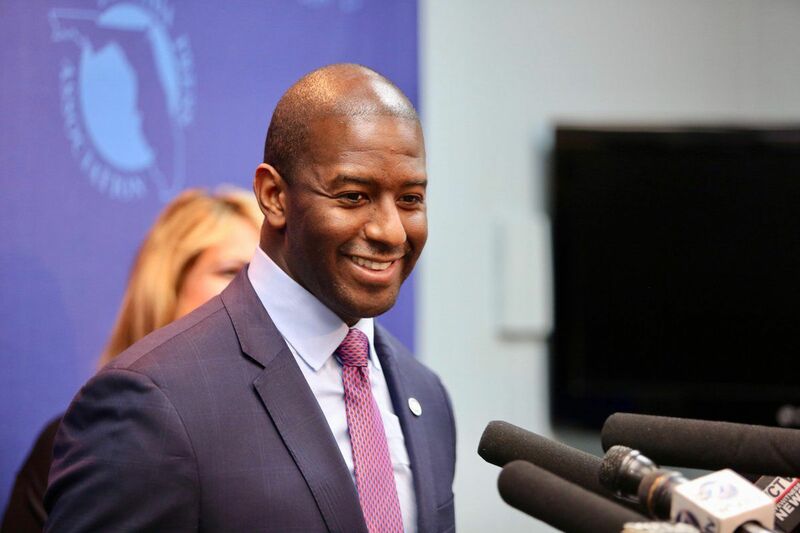 Andrew believes that the best way to address the impacts of climate change is to embrace a plan to transition Florida to clean energy as rapidly as possible. Achieving this goal will put us on a path to a completely clean energy economy, creating thousands of new jobs in Florida, and cleaner air and healthier families. Andrew is also deeply concerned with Donald Trump and the Republicans’ assault on the EPA and its critical role of protecting our children and families from toxic pollution. If Trump and the Republicans roll back critical safeguards like the Clean Air and Water Act, Andrew will act to make sure that Florida implements its own safeguards, so that corporate polluters are not allowed to spew unlimited amounts of mercury, lead, sulfur dioxide or other pollutants into our air and water. This approach will sharply reduce toxic pollutants like carbon, mercury and sulfur dioxide. Doctors say this will dramatically reduce the rates of heart disease, asthma, respiratory diseases, and even cancer – especially for children and seniors. We have an obligation to do something now, so we don’t leave our children and grandchildren a planet that is damaged and polluted. As Governor, Andrew will take on the challenge of rebuilding Florida into a more resilient state and protecting our natural resources that make Florida the nation’s number one tourist destination. Andrew will make protecting the Everglades and Lake Okeechobee a priority, work to keep our water clean from toxic algae blooms, and fight to protect Florida’s access to clean water sources. Our state’s climate change crisis is not confined to our environment — it’s an economic challenge that is threatening homes and businesses, and if we simply leaned into this challenge, we could create good-paying jobs that you can’t outsource overseas. These jobs would allow people to better support their families as we manage the greatest environmental threat Florida faces. Governor Scott has turned his back on creating these jobs and the wages that come with them. Vote for Andrew! To support his campaign, please contribute and get involved. More than 90% of Americans want labeling on GMO foods. Very little unbiased, independent scientific research has been done into the health and environmental implications of GMOs. GMO labeling would also help level the playing field for small farmers who are already going to great lengths to take contamination-prevention measures.